Safe and suitable Wheels for Syrian Hamsters. Most popular seem to be 27cm wodent wheel, 28cm Trixie wheel and 29cm Karlie Wonderland wheel - depending on the size of your Syrian and your like or dislike for sanding and painting! 27cm wodent wheel tends to be a good standard and long-lasting wheel. 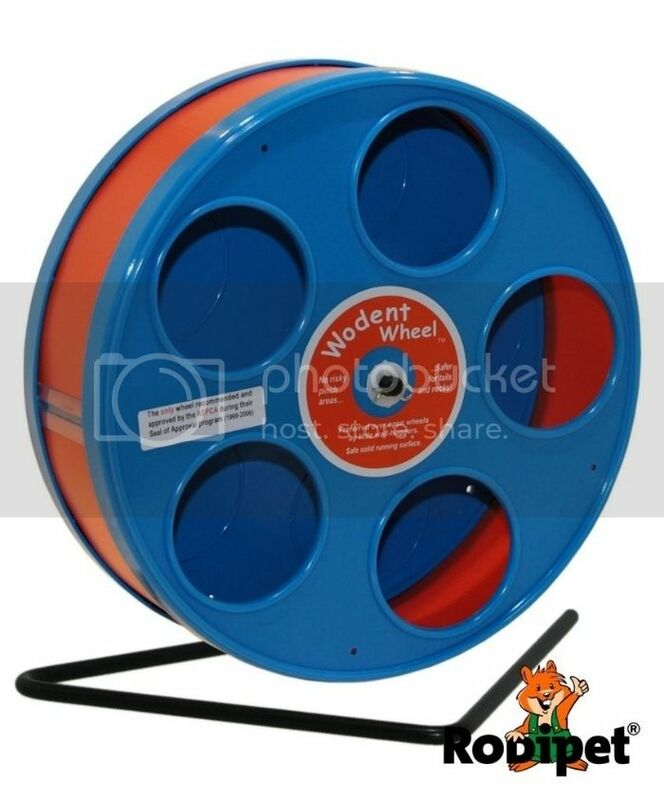 Senior Wodent wheel 27cm (available from the Sugarglider shop, choice of colours). Good size for most syrians except very large ones. Fairly quiet and run well. Occasionally they squeak and there are fixes for this. Can be hung upside down in the cage and can run better like this. Also available from Rodipet in Germany who stock all spare parts. Available in the US, UK and Germany. Trixie wheel 28cm (Wodent look alike wheel - front pulls off. Easier to clean but not as sturdy so best for average syrians rather than large ones. Can be a bit noisy and rattly - not always. Best on the floor of the cage. Available in the US and UK from Amazon. Zooplus wheel. The same as the Trixie wheel - rebranded (see above pic). Works out cheaper if you are ordering something else from Zooplus with free postage. Otherwise you pay postage and it's not really cheaper than Amazon. Available in UK and Europe. 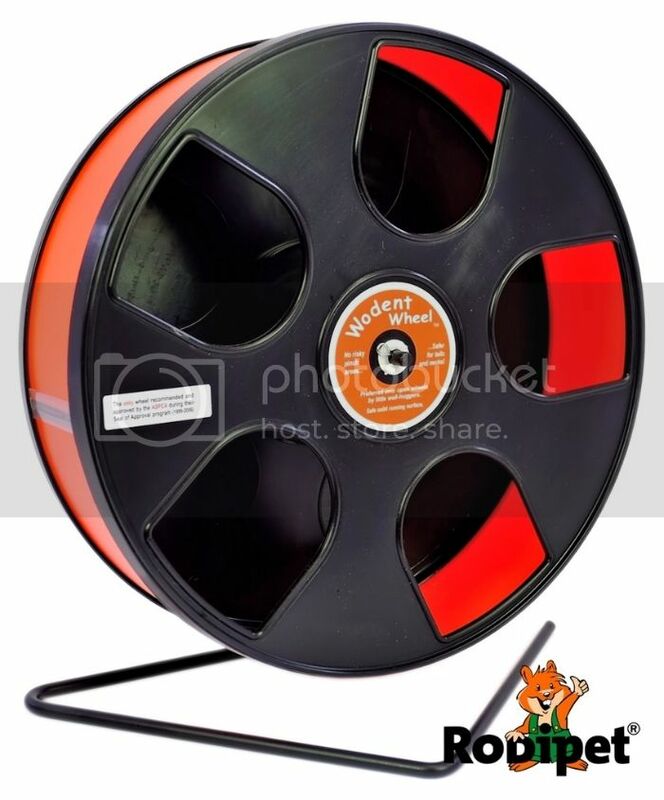 Small Pet Exercise Wheel | Free P&P on orders £29+ at zooplus! Karlie Wonderland Wood wheel 29cm. Virtually silent, nice sturdy wheel. Can have splinters and rough edges - light sanding may be needed. Painting with water based plastikote helps waterproof them. Cheapest at Zooplus. Good for all Syrians large and small. Available in UK and Europe. Wodent Wobust 30cm wheel - large version of the Wodent wheel for large syrians. Takes up a fair bit of space. Can be hung from the top of the cage and runs well like that. Not easily availalbe. Possibly Pet planet if in stock. Otherwise Rodipet in Germany sell them in a choice of colours and stock all spare parts. Postage is £7 from Germany. Available in US, UK and Germany. 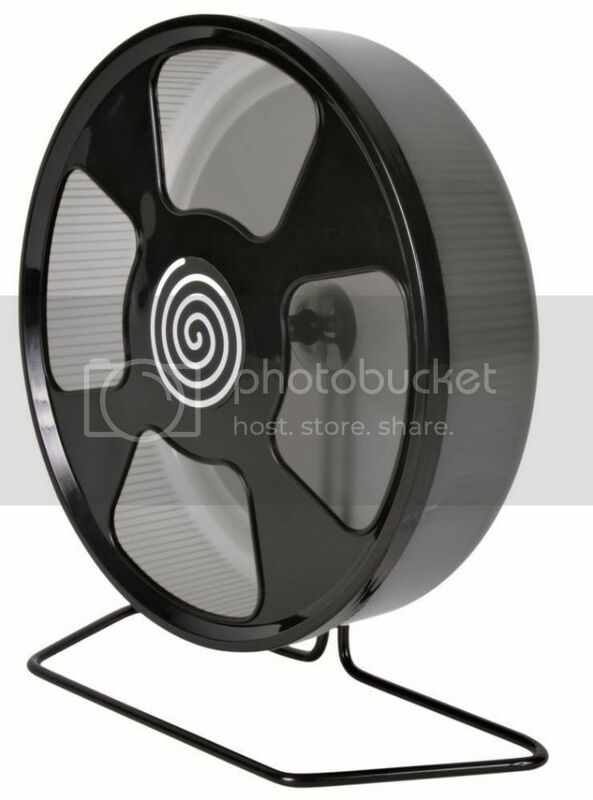 Comfort Wheel 12" - huge, noisy, reports of it breaking easily and quickly. Can be clipped to the cage or freestanding. Silent Spinner 12" - these have had reports of issues in 2014/15 in that they don't spin well. Same dimensions as Wobust 12" (30cm) wheel). ie 33cm hight, 13cm deep approx. Track curves. Can be screwed to cage or free-standing but could put a lot of weight on cage bars and cause bending. Karlie Wonderland cork wheel. Less issues with splinters, soft running track for hamsters feet. Needs plastikoting to help with waterproofing. Good for average and fairly large syrians - not for particularly large syrians. Available in UK on Amazon and Germany on Amazon. 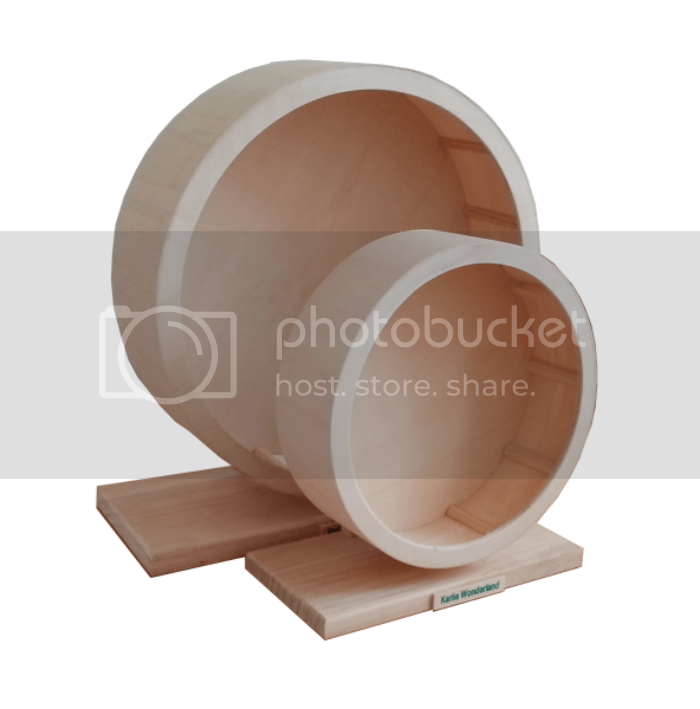 California Storm wheels - available in the US and the UK - work out expensive if purchased from America. 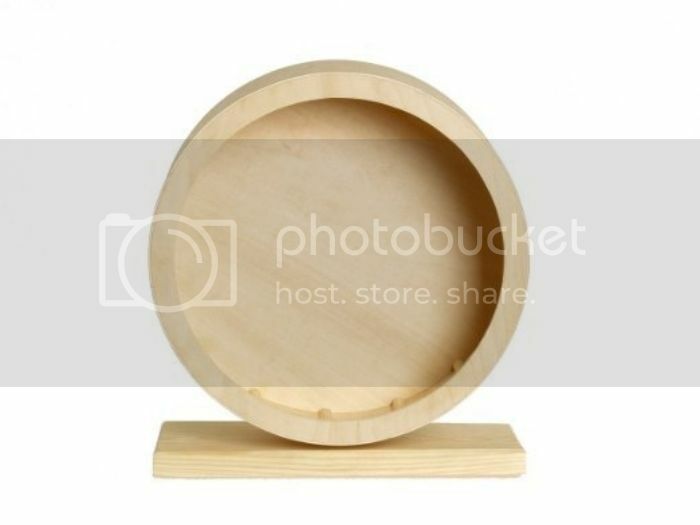 Internal diameter 10.5" (suitable for small syrians). Adjustable height and comes with optional litter tray to stand in. See page for dimensions and minimum heights. Raptor wheel - expensive and not easily availalble - must be a model with a solid track and not a mesh track. Available in the US and the UK. Virtual Keith has details! These are thought to be best as an addition rather than instead of a standard wheel. 11" to 12" size needed for Syrians. Wood and metal flying saucers available but hard to find. 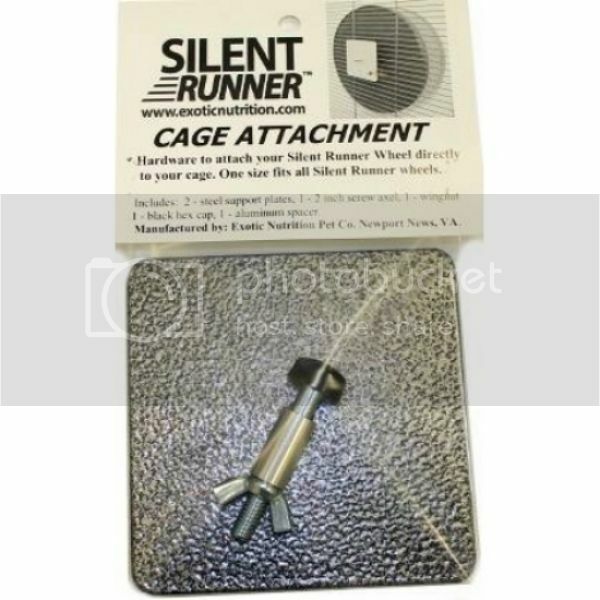 New Silent Runner wheel 12”. 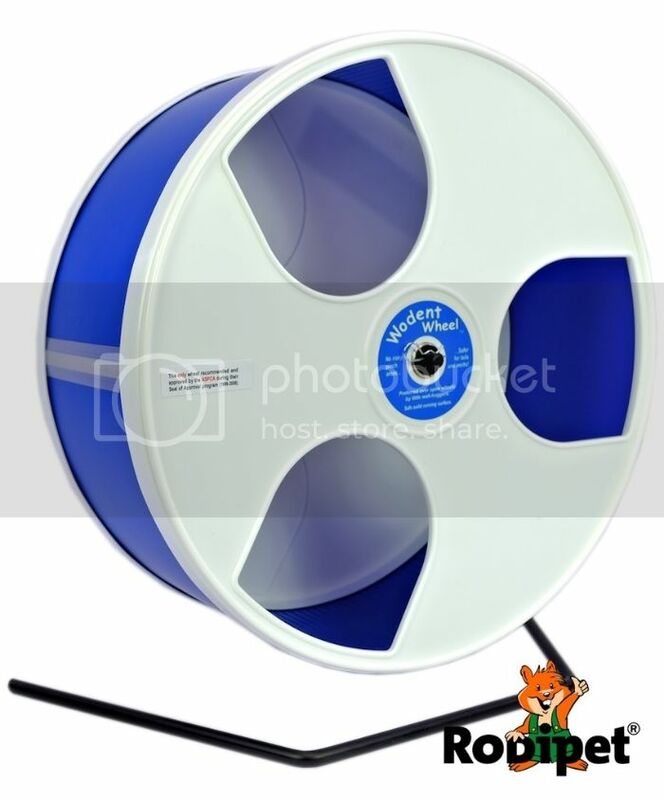 Good alternative to a Wobust wheel and much less bulky – it’s extremely quiet, has a sturdy metal stand, can be cage-mounted with mounting plates available separately, and spins well. 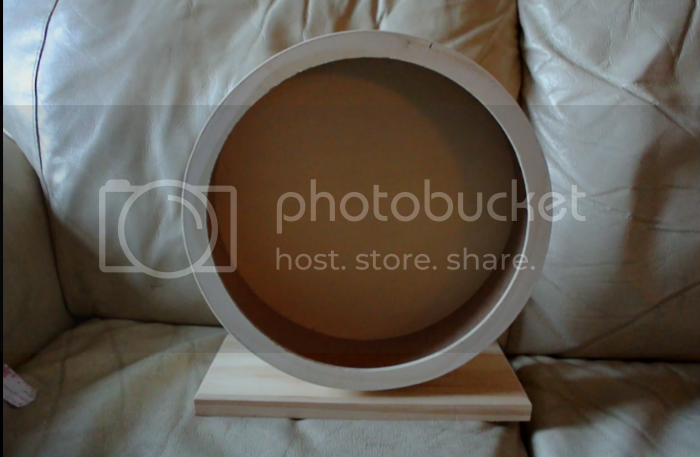 Dimensions are 35cm tall (on metal stand), or about 30cm tall when cage mounted. Depth is approx 9cm (similar depth to Karlie Wonderland wheel). Available from the Sugarglider shop in the Uk and on Ebay. From Exotic Nutrition in the US. Last edited by souffle; 03-04-2016 at 07:24 AM. Karlie Wonderland wood wheel 8"/20cm (again needs checking for splinters especially on tread areas, and possibly light sanding. Plastikoting recommended. 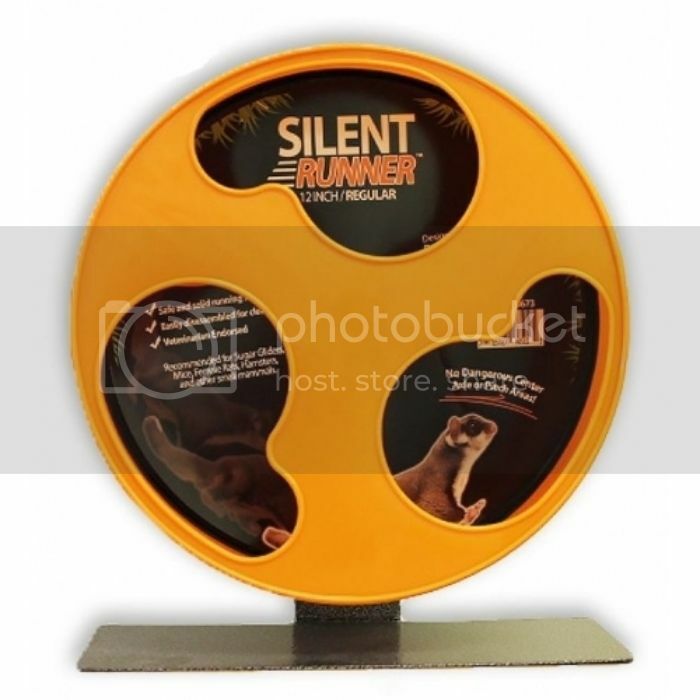 New Silent Runner 9" wheel from Exotic Nutrition in the US and available from the Sugarglider Shop and Ebay in the Uk. Flying saucers for dwarf hamsters - 7" size recommended. Last edited by souffle; 03-04-2016 at 06:00 AM. Thank you - I have stickied the thread. I personally have never had any issues using the Wodent wheel Junior for syrians. It has been big enough for all our hamsters. Drawbacks are that they can chew them especially along the rims of the entrance circles and on the join of the running track. Pin is tricky to get out and in during assembly and cleaning. Water based plastikote paint can be brushed on and is available in different colours or just clear. 2 or 3 coats help waterproof smooth wood items. Coats dry in a few hours. Pet-safe and doesn't really smell of anything. Wow! Thank you for gathering all of this information Serendipity! I'm sure beginners will learn a lot from this post. I think Serendipity should just be put on retainer by the forum to comprehensively summarise all aspects of hamster care great post! LOL! I totally agree, Shannon! I love my hamily! Frodo(Robo), Toothless(Syrian), Dos(Syrian), Albus(Syrian), Neville(Syrian). Thanks Serendipty great guide! I need to get Nibble a wobust wooden the wheel and was having difficulty finding one. Off to rodipet I go! Lol. Making lists of wheels doesn't make me an expert on hamster care! There are breeders on here and moderators, who know a lot more. I did get a bit of a wheel fetish this year though lol, as some of you know. 4Taylor20 that's a great comparison on sizes.